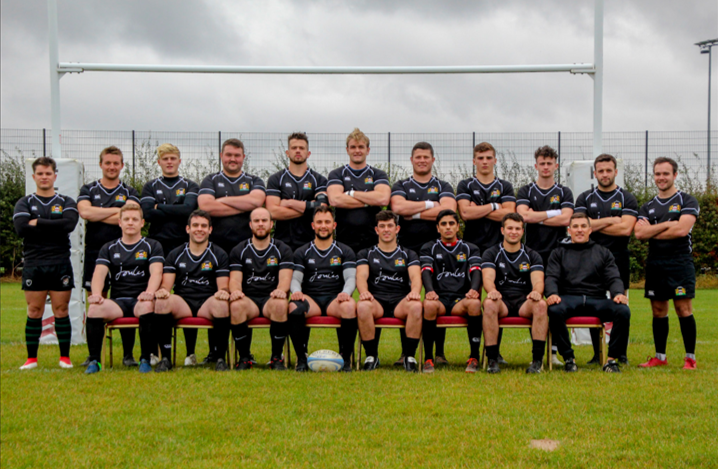 Harborough saw off a determined Long Buckby 29-20 to register their 7th consecutive win which pretty much guarantees a home play-off match on the 27th April. Changes at fly half and outside centre saw Carl Strickson make his debut for the First XV in the 10 shirt and Geordan Stout step in for the unavailable Milkha Basra. Jack Digby returned to the starting line-up, as did George Lee and James Melody. Fin Clarke came in to the squad to provide backs cover from the bench. Long Buckby were a much better side than their league position suggests and were looking to complete the double over Harborough following their victory in atrocious conditions just before Christmas. They dominated possession for much of the first half and took an early lead through a well worked converted try and a penalty. At 10-nil down Harborough were facing an uphill battle and were struggling to get any phases together in order to put pressure on the visitors. When the home side did manage to mount some pressure with some more controlled rugby Chris Bale broke through a gap in the defence to score in front of the posts. Laurence Joel converted to bring Harborough back in to the game. With momentum building Harborough started to find some rhythm and launched a smooth attack through great hands in the backs and a line break from full back Harvey Slade. Drawing the last defender Harvey put Josh Haynes away down the left wing whose pace saw him leave the chasing defence for dead. Laurence Joel converted from wide out and Harborough went in to half-time with a narrow 14-10 lead. Momentum swung back Long Buckby’s way with the second half only a minute or two old. The restart was uncharacteristically dropped by Harborough which gave Long Buckby an attacking scrum deep in Harborough’s half. Some decent phases allowed them to build some pressure which resulted in a try which they converted to take the lead 14-17. A lead they extended soon after with another penalty to take them 6 points clear. With relegation still a possibility Long Buckby were giving their all and only a few unforced handling errors prevented them from building more pressure on the home team. Fortunately for Harborough Laurence Joel was leading the defence in midfield, as he did last week, with countless tackles that stopped the attacking side in their tracks. It was a fine defensive display which was helping to keep Harborough in the game, as was the outstanding work in the contact and breakdown area from Lee Butler and James Melody. With time ticking away Harborough kicked a penalty to the far left hand corner. From the resulting line out Chris Bale collected the ball and charged over the line for his second try. The conversion took Harborough in to a slender 21-20 lead. There was time for the Harborough Number 8 to score his second hat trick in 2 games to extend the lead but it remained tense for the final several minutes as Long Buckby remained just 6 points behind. The home side managed to see out the final stages of the game with some well controlled phases which resulted in a kickable penalty. Laurence Joel took the 3 points with the final kick of the game which denied Long Buckby a losing bonus point. The final result was 29-20 which was a little harsh on the visitors who had performed well for long periods of the match. Harborough proved that they can win even when not playing to their full potential but know that they will need to fire on all cylinders both next week and in the play-off game in order to keep the winning streak going.